The A/V Binloop HD is the ultimate frame accurate synchronized audio and video player. Captivate your audience with content displayed across 8.3 megapixels. 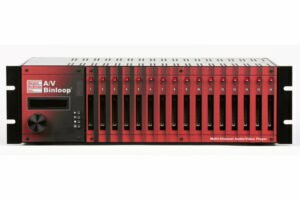 The A/V Binloop HD is a multi-channel video and audio player capable of playing back two channels of video with four times more resolution than full HD! 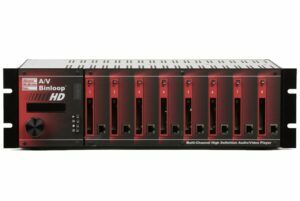 The A/V Binloop HD provides up to 8 HD channels of synchronous or asynchronous video and 16 tracks of 16-bit audio in a small form factor. It can be used as an A/V source for one show or for an entire building. 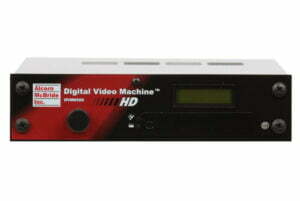 It can playback MPEG2 or MPEG-4/h.264 video at bitrates up to 40 Mb per second and at resolutions up to 1920 x 1080. 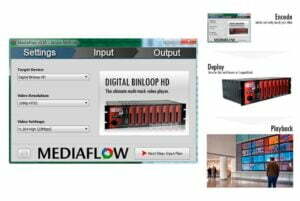 The A/V Binloop HD is perfect for video wall applications. 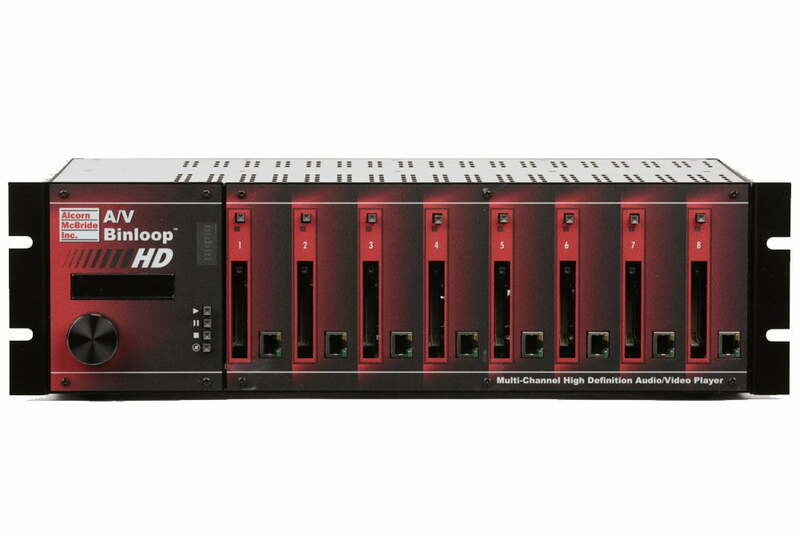 Unlike most commercial video devices, the A/V Binloop HD provides a full HD video source to each screen. This eliminates the loss of quality due to stretching commonly seen in traditional video wall controllers. For large applications, it’s easy to sync multiple units and the content can be managed via Ethernet. True to Alcorn McBride engineering, this is a solid-state player. No hard drives, just simple removable CompactFlash storing hours of HD content. Experience Full HD quality with Alcorn McBride reliability. The bundles listed below include the AV Binloop HD cage, DBAP5 controller card, and between 2-8 reproducer cards. CompactFlash cards are required for each reproducer and are sold separately. Voltage 110-240 Autosense, 350W max. MPEG video decoding technology licensed from MPEG-LA. Multi-channel audio formats are multiplexed as part of the audio/video bitstream, and are also output as a digital bitstream that requires an external decoder for conversion to analog signals. * Specifications subject to change without notice. “Dolby” and the Double D symbol are trademarks of Dolby Laboratories. MediaFlow is an easy to use video transcoding tool to prepare content for Alcorn McBride video products. 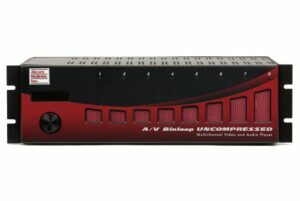 Configure and test your AV Binloop HD. Sets timecode operation, triggers and addresses.